A man has admitted murdering a mother-of-two who was found dead at a house in Halifax. Jordan Thackray, 27, of East Grange View, had denied killing Jessica King, 23, in August and was due to stand trial. 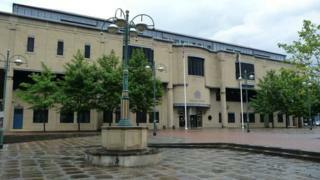 His barrister, Paul Greaney QC told Bradford Crown Court he now wished to enter a guilty plea. Thackray is due to be sentenced on 19 January pending mental health reports. He was remanded in custody. Ms King was found dead by police at a house in Oxford Lane, in the Siddal area of Halifax, on 27 August. Mr Greaney told the court Thackray had prepared a note in which he provided a full explanation of the events that resulted in Ms King's death. "I can tell your honour that in the note he takes full responsibility for the death of Jessica. "He expresses remorse and moreover in it he expresses a strong desire to plead guilty to murder," said Mr Greaney.